Just a few years ago, many informed observers considered Belgium’s Stefan Everts, a four-time World motocross champion, to be the fastest outdoor motocross rider in the world. Since that time, Everts had two seasons of injury and frustration, and now, in the 500cc class, he is on his way to his fifth World championship. Everts is back on his form. 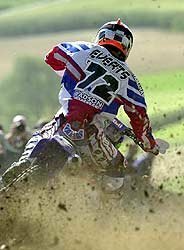 The 2001 Motocross des Nations will be held at Namur, Belgium on September 30 — Namur is Everts’ home track. The showdown at the Motocross des Nations that everyone is looking forward to is Kawasaki’s Ricky Carmichael vs. Yamaha’s Stefan Everts (America vs. Belgium). Carmichael has been labeled just as often “the world’s fastest outdoor motocross racer”. As far as we know, Carmichael has never raced a healthy Everts in the same class. Carmichael will clearly be aboard his KX250, while Everts will ride his works, Yamaha YZ 500FM four-stroke at the Motocross des Nations. The big four-stroke will probably give Everts an advantage over Carmichael on the fast, Namur track. Nevertheless, Carmichael easily disposed of the 500 class riders at last year’s Motocross des Nations (although Sebastien Tortelli did beat Carmichael in one moto — Tortelli was also on a 250). This is very likely a rare opportunity to watch the two fastest outdoor motocross riders of this era battle head-to-head. In the Motocross des Nations format, Carmichael and Everts will race at least one moto together, and possibly two (if Carmichael is designated the “open class” rider for the U.S. — America’s Kevin Windham will be on a Suzuki RM250, and there will be no pure, open-class rider from the U.S.).